I’ll admit it: Most of the time, when one of my kids stays home sick, there’s only one activity on the agenda: TV. 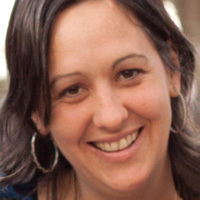 It’s a sure-fire guarantee that my kid gets plenty of rest, and it gives me the chance to get plenty of work done even while staying home with her. I don’t believe there’s anything wrong with letting a sick child spend the day lounging on the couch watching movies, but it’s not the only thing to do on a sick day. Even the most devoted TV fan might get bored after a while, so if your child is up for it, here are some other, more hands-on ways to keep them from being bored while they get better. For the younger bunch, pulling out a stockpile of sick day books is a great way for them to pass the time and feel a little less isolated. 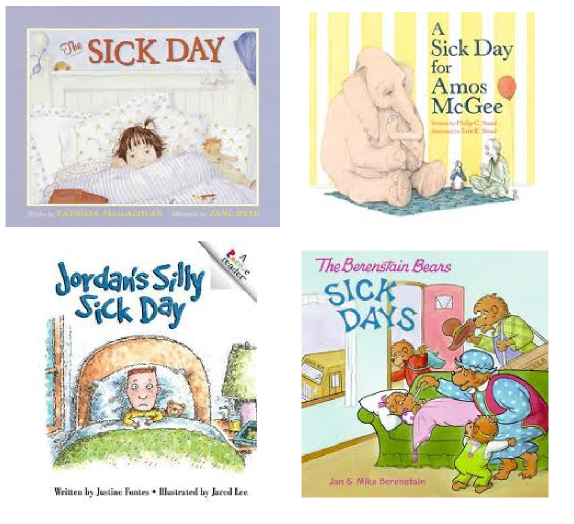 These titles – The Sick Day by Patricia Maclachlan, A Sick Day for Amos McGee by Phlip Christian Stead, Jordan’s Silly Sick Day by Justine Fontes, and The Berenstain Bears: Sick Days by Jan Berenstain – are fun reads to help put a smile on your child’s face. 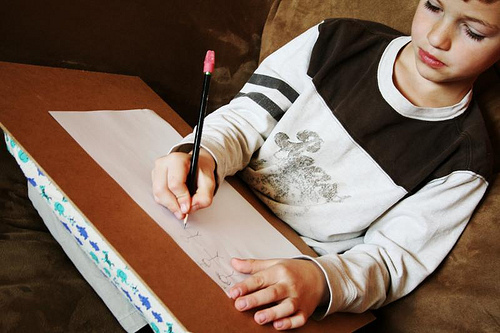 A lap desk makes drawing, coloring, writing, or even catching up on homework easy to do while in bed or on a comfy couch. This DIY lap desk from Balancing Everything is an easy project for Mom to tackle. Crafts are always the best quiet, at-home activities for kids to do, but when your child is sick, it’s important to keep any craft projects simple and frustration-free. 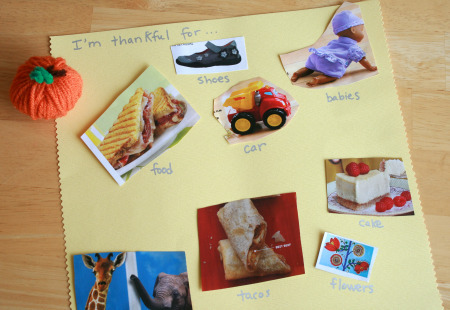 Making collages from old magazines, like this one from Marie LeBaron for Make and Takes, is a fun way for your child to make something for a friend, family member, or even his or her own bedroom wall – and it’s a great way for you to recycle that pile of magazines you keep meaning to toss! How do you keep your child entertained when she’s home sick? 6 Foods that Protect Your Skin From the Inside OutWhat’s Behind the Startling Increase in Autism Cases?